When you create a release with no targets, and then try to deploy it, Deployment Manager shows a misleading error message. "Not authorized? But I'm an administrator!" This was a real problem for us when we moved our targets to a new environment. Because you can't yet move servers in the UI, we had to add copies of the servers to the new environment and delete the old one. That message really confused me till we worked out we also had to update all the projects that deployed to the deleted environment. 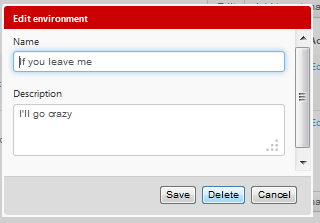 Instead of letting me create an undeployable release, an error message like this would help. You cannot create a release with no deployment targets. 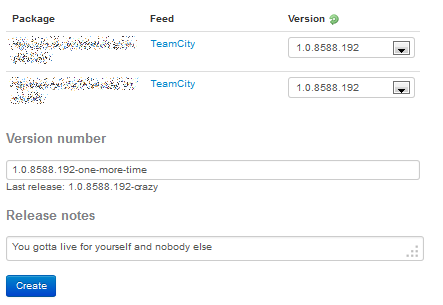 The bug affects Deployment Manager v2.3.4.13. Here's a repro, best enjoyed with music. Create a new environment with a target machine. It's okay to just make up a machine name here. Set a project to deploy to the environment. Change all the steps of a project to deploy to the new environment. Now things get a little strange. Create a new release for the updated project. 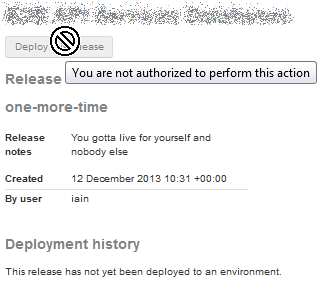 Deployment Manager doesn't confirm whether I can actually deploy the package at this stage. The deployment button is grey instead of blue. The cursor changes to a no symbol over the button. A tooltip appears with the misleading message.